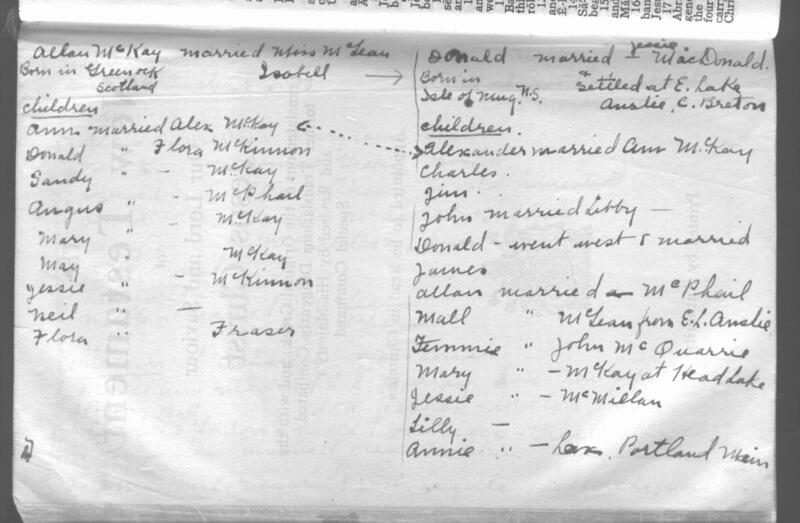 1936 inscriptions in Estelle’s Bible listing McKAY family in the Lake Aisnslie and Mabou area of Cape Breton, Nova Scotia, Canada. My McKay ancestors came from the Isle of Muck in the Inner Hebrides on the West Coast of Scotland, south of the Isle of Skye, Isle of Egg, and Isle of Rhum. We now believe they came from Durness in the North East of Scotland before they came to the Isle of Muck. They probably left during the Highland Clearances when landowners evicted the tenant farmers in favour of the more profitable sheep. They came to the Mabou and Strathlorne area of Cape Breton, Nova Scotia, Canada before 1862. This is in the South-West of Cape Breton. 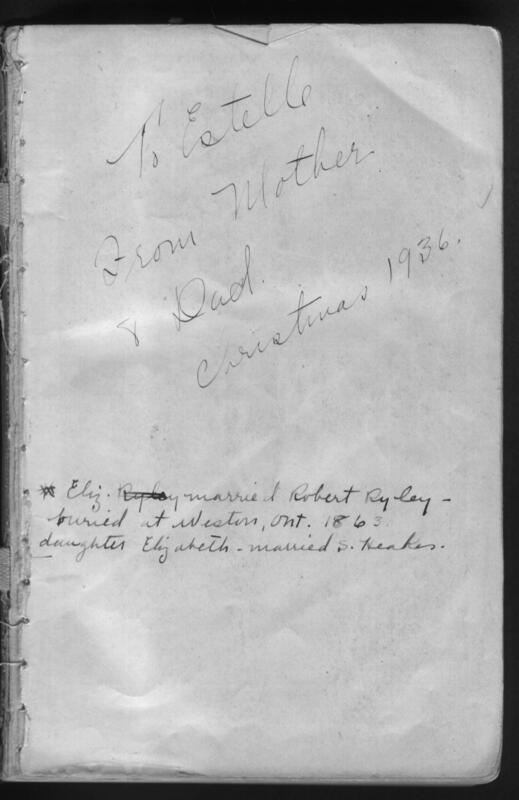 Here are some inscriptions and family tree from a 1936 bible of Estelle. 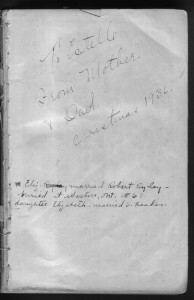 The family tree was written in by her mother, when visiting with McKay relatives in Mabou, Cape Breton Island, Nova Scotia in the late 1930s. The bible also holds family information on other branches of the family, but it is not reproduced here for reasons of personal privacy. My Great-grandfather Allan Daniel McKay was born in Mabou on September 29, 1862. He worked for the Plymouth Cordage Company and moved with his family to Plymouth, Maine, USA where his daughter (my maternal Grandmother) Mary McKay was born. We believe he was a manager and ended up with the Plymouth Cordage Company in Welland, Ontario. He died April 6, 1937 and is buried in Woodlawn Cemetery in Welland, Ontario (near Niagara Falls). 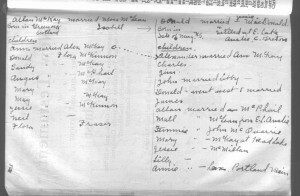 He married Mary Sarah Beaton, also of the Mabou area of Cape Breton. She was born November 3, 1863 and died February 1, 1932. She is also buried in Welland. One of their sons, Charles Gordon McKay joined the Canadian Expeditionary Force (CEF) in World War I and ended up at Etaples, France working in a Canadian Army field hospital. He was killed on 23 May, 1918 in a German aerial bombing raid at the hospital. He is buried in Etaples Military Cemetery, France. He was 23 when he died. A sister of Charles, Mary McKay, also joined the army as a Nursing Sister. She proceeded overseas. She later returned to Canada and met her future husband Harold Harty HEAKES, who was a returned soldier who had Tuberculosis of the spine. 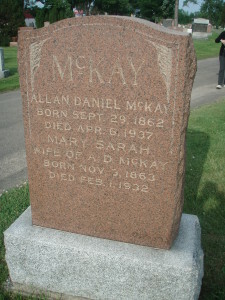 Allan Daniel McKay had a son (?) 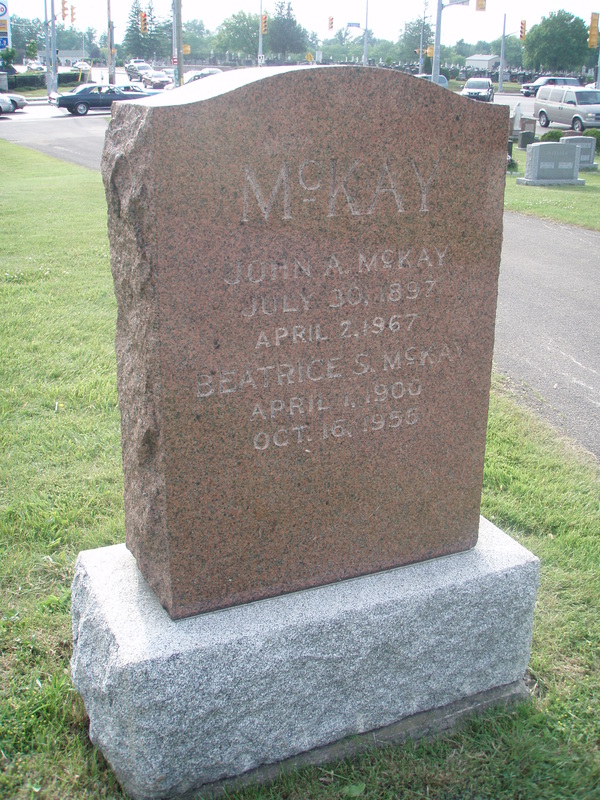 John A. McKay (July 30, 1897 – April 5, 1867) who married Beatrice S. McKay (maiden name was??) (April 1, 1900 – Oct. 16, 1956). 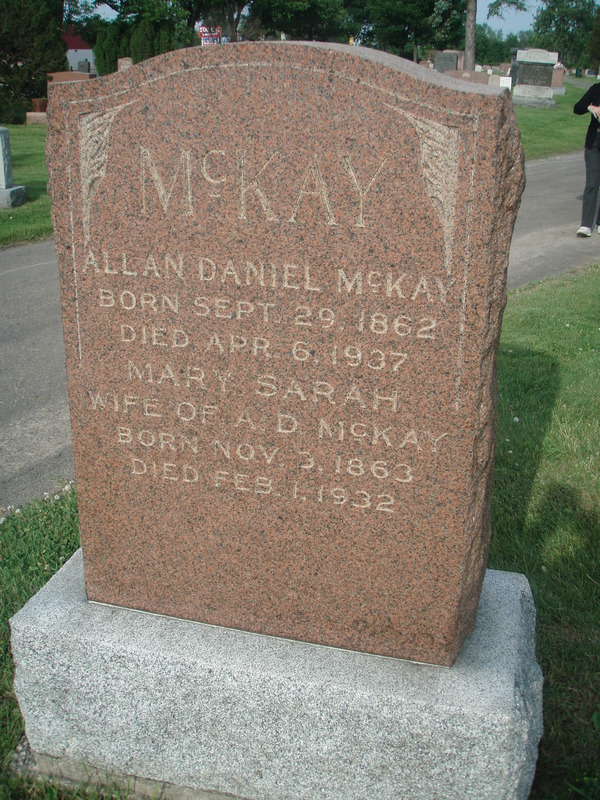 They are also buried in Welland, Ontario, using the reverse side of Allan Daniel McKay’s stone.